The trusted dinghy is becoming more things to more people. A dinghy by another name is, well, a boat. And like all boats today, tenders are getting bigger, fancier, faster, more versatile and maybe a bit more complex. As big boats have had to change to become family-friendly SUVs on the water, so have their compact cousins. We discovered four important ways trusty tenders are changing. The consensus among tender builders is that everyone is reaching for a bigger dinghy. 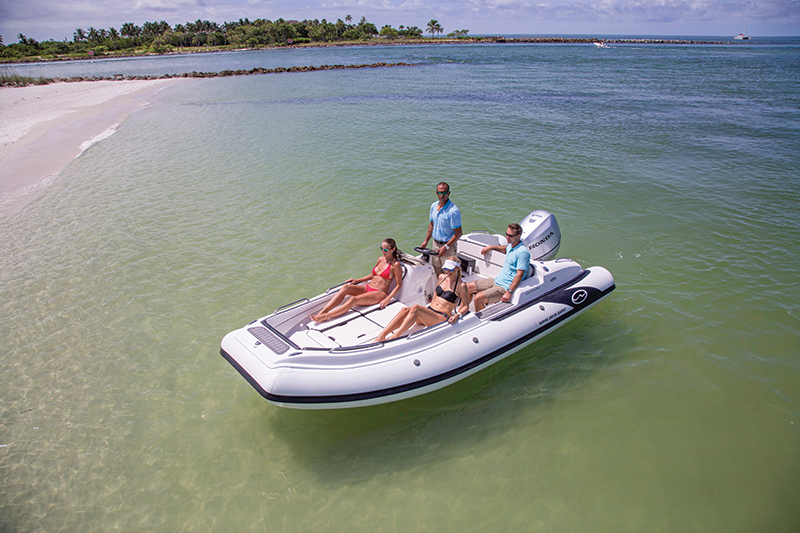 Most cruisers choose the largest tender they can afford, that fits on the big boat and that they can manage with their crew on a beach landing. A 12-foot rigid inflatable boat (RIB) can carry a lot of provisions, but pulling one up on the beach with only two people is difficult. Size and weight are tradeoffs. Single-skin bottom RIBs are 10 to 20 percent lighter but don’t handle rough water as well. Meanwhile, a center console with a double floor and all the goodies can be a handful to get onto the chocks. Walker Bay’s Generation flagship line is finding a happy medium by using a proprietary polyurethane composite micro stringer system that makes the hulls lighter and stronger. The boats absorb wave chop, get on plane faster, and carve ferocious but dry turns with the help of concave chines. Tenders are also gaining interior space. Zodiac’s new 18-foot Open 5.5 has an overall width of 8 feet, 4 inches, more than half of which — 4 feet, 7 inches — is dedicated to inside space. Tubes are getting larger too, because big tubes mean more buoyancy and a drier ride. Most tubes are 16 to 19 inches in diameter, but the Open 5.5 tubes have a whopping 23-inch diameter, so fast runs won’t equal doused bodies. Bigger boats also mean bigger power plants, so outboards are growing too. 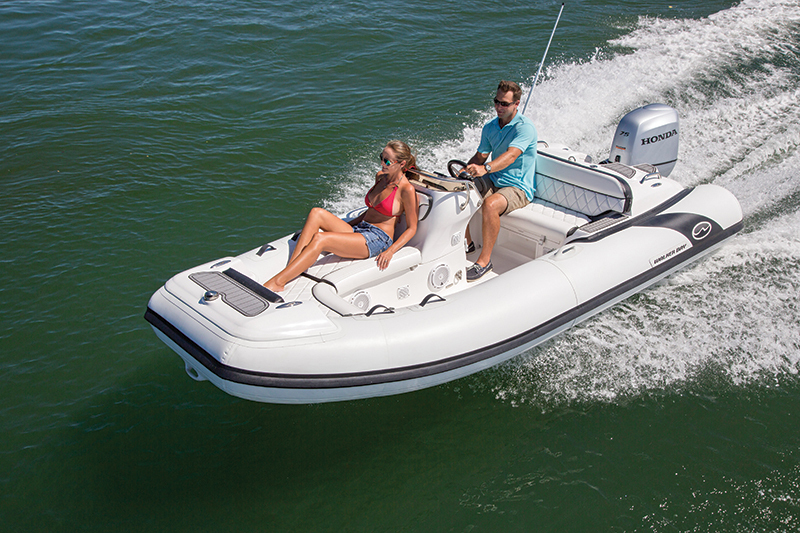 According to Craig Henderson of Bullfrog Boats in Bellingham, Wash., inflatable boats aren’t regulated, so other than manufacturer’s recommendations and guidelines as to the horsepower and weight of outboard, RIBs can pretty much add anything. 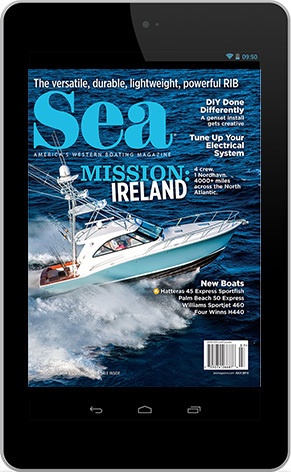 For easy engine management, people tend to choose 8 to 15 hp motors, but many are opting for much larger, and since planing is now a de facto requirement for powerboat tenders, outboards of 40 hp or more aren’t unusual. Mercury just launched a 13-footer that comes standard with a 50 hp engine and an integrated eight-and-ahalf- gallon fuel tank. The total package with motor weighs only 675 pounds and gets on plane in less than three seconds. Fast and quiet is the work of four-stroke engines that barely make any noise in neutral. Of course, for the ultimate in quiet motors, owners can opt for electric propulsion from the likes of Torqeedo or ePropulsion. To avoid carrying gas on a diesel-powered main ship, a propane-fueled Lehr outboard may be the answer. 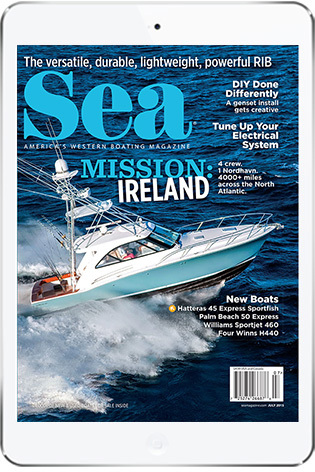 The issue with alternative propulsion is both top speed and range, so gasoline outboards aren’t going to disappear, certainly not as the trend is toward more horsepower, greater torque and higher speed. Rigid hulls are generally made of fiberglass or aluminum. The latter is strong, puncture resistant and light but also potentially noisy and in need of a sacrificial zinc if it’s to be kept in saltwater for long periods of time. “We build with aluminum hulls because there are lots of rocky beaches here in the Pacific Northwest,” said Bullfrog’s Henderson. RIB materials and construction methods have changed. Some fiberglass hulls have been made lighter with vacuum infusion rather than a solid hand layup and others have been shaped with chines and vents for better performance. puncture a tube, it’ll still float,” Henderson said. 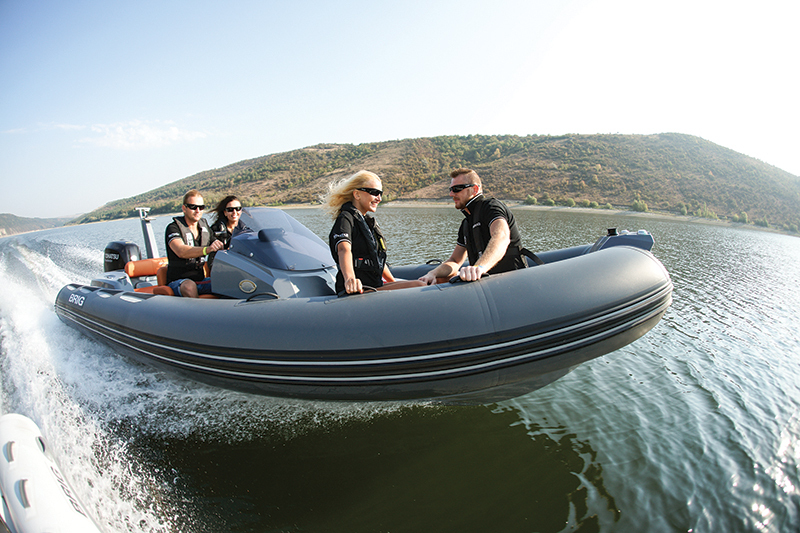 Rigid and unsinkable, Bullfrog boats are infused with a UV inhibitor, so the tubes never need to be covered, even in sunny climes. However, Bullfrog’s boats are actually regulated as to the size of outboard they can carry since they’re rigid (rather than air-filled) vessels. Walker Bay Boats opened up its bow configuration several years ago and technically reshaped the industry, since many manufacturers followed. The greater volume of the bow increases load-carrying capacity, and a square (less pointy) bow can add up to 20 percent more space. A wider boat is also typically more stable, and since these vessels are now zipping around on plane, stability is key. Technology trickle-down is changing tenders into highly personalized toys. 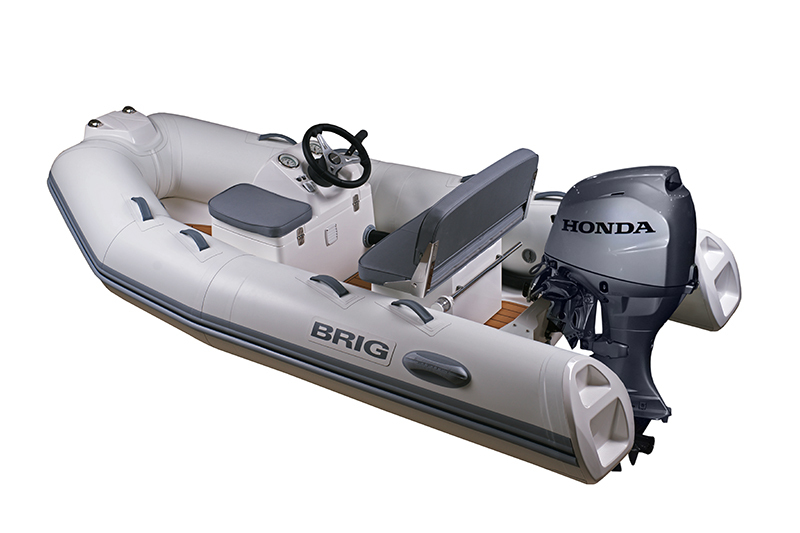 As electronics get smaller and less expensive, and add-ons become lighter and more practical, dinghies are gaining fancy features. Among the more popular options are sunpads and deck extensions for sunbathing. The Zodiac Open 5.5, for example, features a sundeck with angled backrests for comfort and optimal sunbathing. Walker Bay’s 15-foot Generation 450 has a starboard-side lounge and the model just above it, the 525, has an optional sunbed where the entire forward section of the boat turns into a large pad. Rear platforms are making fishermen happy by providing a place to stand or stow buckets of bait, while more handholds — both textile and metal — are perfect for kids. Even the family dog is now top of mind with tender builders, with models that provide more and flatter deck space, so Fido can keep a pawhold. 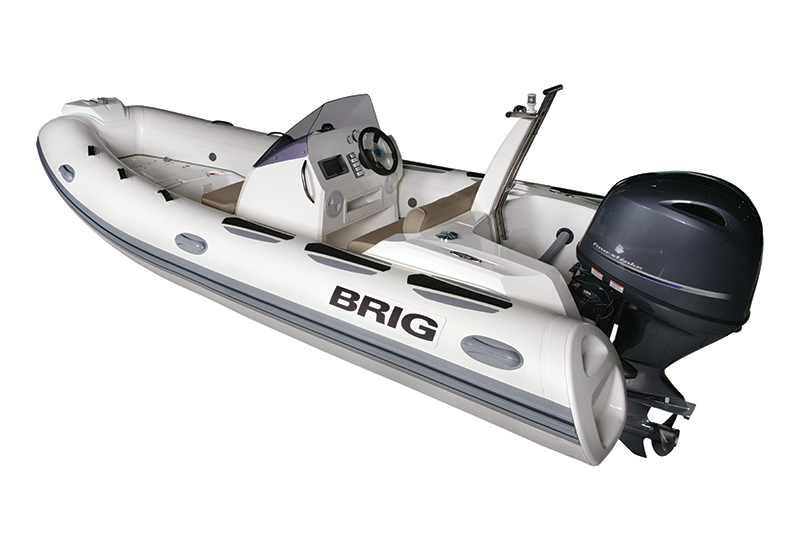 Brig boats come with SeaDek premium flooring on their platforms, adding a nonskid surface that provides grip even when it’s wet. 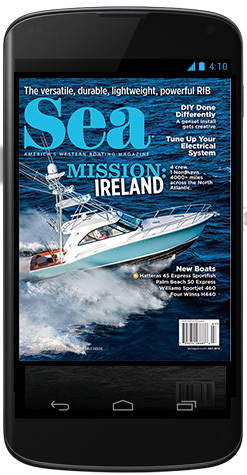 Navigation lights are now mostly standard on center console-style tenders, and LED color-changing underwater and courtesy lights are becoming popular options that improve ambiance as well as nighttime boarding. Many cruisers are opting for shade for their water taxi, and builders are getting creative with various kinds of Biminis. Cupholders, boarding ladders and integrated lifting harnesses are becoming de rigeur. Brig tenders longer than 14 feet offer a freshwater shower, and the 18-foot Novurania — the smallest of its Catamaran series — has an opening bow that lowers like a ramp, so passengers never have to climb over a tube to get on or off. It’s also a great platform to dive from or to roll a bike on for exploration ashore. However, by far the most often-requested additions are electronics, including small-footprint displays with GPS and electronic cartography, VHF radios, Bluetooth-enabled stereos and sonar/depthfinders. This means console dashboards must accommodate electronics, and sonar has challenged builders to find a suitable locations for transducers. Some manufacturers, Williams Jet Tenders among them, even work with certain boat builders to offer dinghies that are color-matched to the mothership. Check out Beneteau’s Monte Carlo line for a look at a matched set. Brig, which built 700 tenders last year, touts that its Ukraine-based factory — staffed by engineers of the defunded Soviet-era aerospace industry — is the biggest purchaser of tender fabric and offers more color choices than anyone. “Although we can offer more colors, about 75 percent of the tenders we sell are white, and that has trended toward a bluish white lately,” Tomkins said. Loaded with goodies, tenders are uber-toys fit to go fishing, diving and distance cruising. 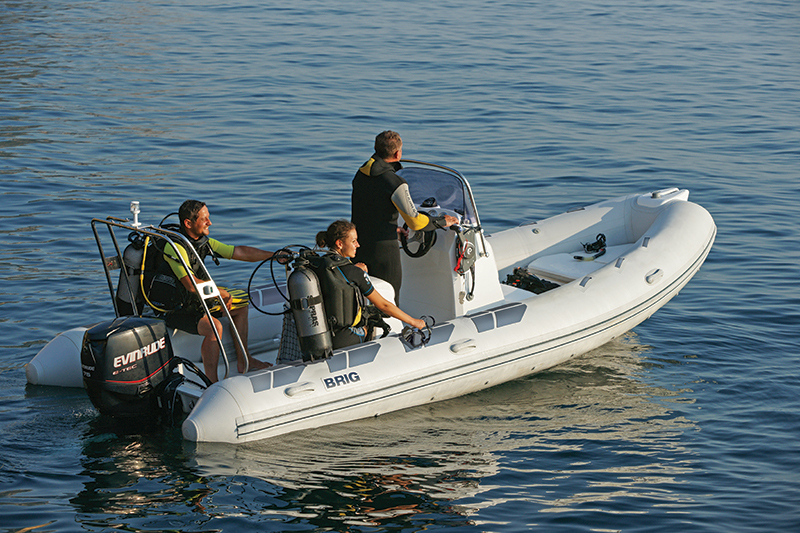 With a larger engine and fuel tank, a tender can be used to visit remote coves maybe 25 miles away, quickly and safely. Ski masts make dinghies platforms for wakeboarding, and extended decks create casting platforms or a prep space for dive gear. Some tenders even include dive-tank chocks. Brig has added unique fiberglass end cones to its tubes that serve to stiffen the craft and provide good footholds for boarding from the water after snorkeling. Fishing has become a popular duty of the tender, and many of them now include clever stowage options to hide lures and hold rods. Today, tenders must have multiple personalities. Whether shuttling to dinner, cruising the cove during happy hour, exploring the backside of an island or pursuing serious watersports, dinghies have to wear many hats. Gary Durnan, president of Zodiac North America, hit it on the head when describing the Open 5.5 as a Swiss army knife. Dinghies are the family car, and as such they’ve had to become SUVs that can do just about anything and look good while doing so.